Dell are best known as a PC manufacturer but they have also always made some great screens to sell with their computers. The UltraSharp U2515H is no exception and is one good looking monitor. At 25 inches the U2515H falls inbetween the the popular 24″ and 27″ size formats. So if you want something a little bigger than before but, like me, feels a 27″ monitor is just a little big to sit directly in front of, this could be the monitor size you are looking. The UltraSharp isn’t directly aimed at gamers, you don’t get features such as a high refresh rate or adaptive sync designed to enhance your gaming experience but that doesn’t mean you can’t play a game on it! We’ll take a look at how it holds up and what type of PC owner this monitor will appeal to. Dell make good looking monitors, this one comes with an ultra thin bezel for that near borderless look. Great if you want to have two side by side. The monitor has no analogue connections so if you are hoping to use VGA or DVI you will need some kind of adapter, but to get the most out of modern screens it’s time to update to your graphics card to the new standards. It does come with DisplayPort, mini DP and HDMI so you have a few options. There are a massive five USB 3.0 ports included but they are slightly awkward to reach but this helps keep the monitor slim and the bezel thin. Dell have ensured good ergonomics with all the height, pivot, swivel adjustments you’ll need to get it where you need it to be. Never underestimate the value of this, I’ve suffered from having monitors that lack a good range of movement! This monitor doesn’t contain any gamer specific hardware, but don’t let that put you off right away, if you are looking for a great picture, quad HD, and 25″ then you will want to consider the Dell UltraSharp. The IPS panel affords fantastic colour reproduction across wide viewing angles, this means that even when looking side on you still get a great image on the screen. If you like to play games on the side, but also need a decent quality screen for working and graphics manipulation then the Dell is a good candidate for you. The pre-calibrated, out of the box image is good in its own right, but take the time to set it up right and you’ll find the UltraSharp can go one step further towards great pictures. This is a 60Hz monitor, so if you are looking for high refresh rates then this isn’t for you. On the other hand if you want to pair it with a console locked at 60Hz or have games that rarely break past the 60 frame per second barrier then this stat shouldn’t put you off. An equivalent quality screen running at 144Hz is going to cost a lot more so if you won’t take advantage of that higher refresh capability – why pay for it? The Dell works particularly well for slower paced strategy games, the high resolution and great image reproduction will really stand out. That said, the IPS panel still manages an impressive 5ms response time which is good for faster action games. We give the Dell UltraSharp U2515H a 4.5 out of 5 rating. Want to know what existing owners of the monitor think? You can read real user reviews here. Should I buy the Dell UltraSharp U2515H? 25" monitors are fairly rare and the Dell must be one of the best examples out there right now. The IPS based screen is exceptional and whilst it isn't marketed at gamers the screen quality and non-standard size may make this the right choice for you - especially if you are looking for a high resolution top quality screen to work on too. If you are having some doubts about this purchase then why not read some real owner reviews and see what other buyers think. Welcome to the Dell UltraSharp U2515H FAQ. This section attempts to answer common questions you may have, please get in touch if you have any more queries or if you think our answers need updating. Would anyone recommend this monitor for accurate colours and black and white contrast? This monitor has an IPS panel, it’s strength is in the picture quality. 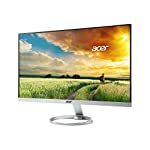 With the high 2560 x 1440 resolution this would suit someone looking for an all round good screen rather than an out and out gaming monitor. Will this connect to a iMac with the leads supplied? If it has a DisplayPort connection you should have not any problem rigging up this monitor. ViewSonic VX2573 or this monitor which is better for playing RPG like the whitcher 3 please.